The students of the University of Toronto’s Jazz Music faculty are a moveable and ever-changing pool of gifted musicians who not only read and play with distinction, but often go onto make a name for themselves in contemporary music, many of whom once they’ve exited the imposing portals of the U of T (as it is commonly called) move on to stellar careers on their own in Canada and elsewhere. While at the U of T, however the very best of these young men and women usually grace the University of Toronto 12TET there to fall under the spell and the giant shadow of Music Director Terry Promane. 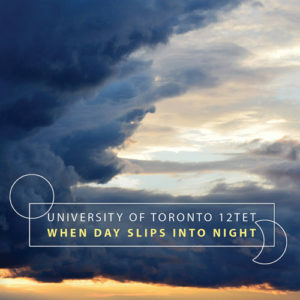 Lately Mr Promane has also been leading the U of T 12TET as they cut the annual album which is always a joy to listen to for every conceivable reason that albums of music become irresistible. Big band music can be well-read and also often sound dry and uninspired. But this is never the case with the U of T 12TET. Much of this has to do with the vivid arrangements such as those by 12TET band-members Michael Hanley and Noah Franche-Nolan, such as “Isaya” and “(Ocean) Bloom”. But there is also the fact that the musicians themselves bring life to the music as they play their respective solos or in ensemble passages. This is true everywhere on this album, but truly outstanding in the broodingly percussive tumbling groove of “Ready Wednesday” where the lone solo is by pianist Noah Franche-Nolan is launched from a gigantic complex of ensemble playing. Overall, though there is a considerable degree of balance and integration of melody, harmony and rhythm, of composition and improvisation, of exploration, individuality and tradition is impressively maintained throughout this outstanding album. The future of Canada’s contemporary music scene is indeed in good hands and for yet another year because this is because of the musicians who grace the University of Toronto 12TET.